I've been mulling over a few little expansions - These would take the existing 2.5 bed system to a 3.5 bed + 2 blue barrel tree system. One 1000L system would be located in a poly tunnel, the other 1000L system would be located in a shadehouse. So this is my design so far. 1. Have I allowed enough height for trees? 2. 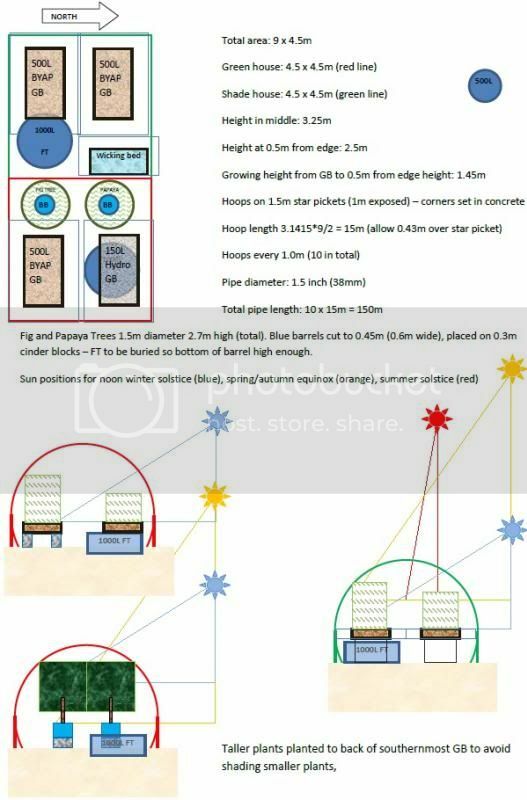 Is it a good design to have the poly tunnel/greehouse hoops mounted on 1m height of star pickets? 3. What measures should be undertaken to secure the green house i..e conrete every star picket ni or just the corners? 4. Is it worth bothering with a greenhouse i..e will I be able to grow toms etc in a perth winter - will the growing season for barra be extended by having a green house? 6. Will the trees shade one another two much in a north - south aspect - I put the papaya to the north as its foliage is not as dense as the fig. 7. Any obvious design flaws that are not obvious to me! 1. not really, but it will do.. Does that include the barrel? You will be able to keep them fairly well trimmed and get fruit from them at that height. 2. Yep, seen plenty of them. 3. Make sure you include a centre ridge as well. Don;t know about the rest..
4. you'll extend it a little, probably not a massive amount, but every little bit helps..
5. Just, we generally allow 600mm, so long as you keep things trimmed you'll be right..
6. Wouldn't worry too much, also the papaya will be quick growing and a bit harder to trim than the fig tree.. Thanks Joel - height includes the barrel + stand so the tree would be ~2m. Perhaps its better not to have the fig in the green house as they grow well in perth anyhow if they have enough water etc. perhaps a dwarf mango would be better in the AP system and consign the fig to an outdoor wicking barrel? System design plans have changed a bit..... Papaya is now going in the backyard system and I'll have two systems in the front yard one covered with shade cloth the other greenhouse material. I had planned on using 2 IBCs for this system - one for the sump, the other for the FT. I realized today that if I put the 2 IBC frames next to one another, I can plonk the 500L BYAP GB on top of them (with some extra bits of wood to spread the load a bit better), thus saving the need for an extra GB frame (the cost of which would cover the cost of buying 3 IBCs and some spare change for some beverages of my choice ). 1) Is it OK to have the IBC liner as the FT without any frame around it? I can't see why not though may be missing something. If I do this I only need to get 2 IBCs and ~2000L of water in the greenhouse to stabilize temps. 2) Would it be better to get 3 IBCs, use one as a FT (with frame) and one as a sump and use the other to store top up water for this system and the adjacent system (down the hill a bit). As far as I am aware - if you take the IBC bladder/liner out of the cage and fill it with water it will bow out. Thanks Arbe - That's just the kind of feedback I was after - That puts option 1 out and may have saved me a trip to buy another IBC when I discovered ! I've plumbed the bottom drain from the swirl separator and have just got a tap on it at present - all the muck collects in the bottom pipe very well - too well in fact - I've been drawing a bucket off every 3 days and its pretty stinky by then - goes anaerobic pretty quick. I will run it into a RFF that will feed back to the sump eventually with a bottom drain in the RFF going to the two IBC wicking beds that will be installed next to the GB in the foreground. The take off points for the GBs are half way up the tank, so will not pull too much solids - I have noticed a bit of solids settling in the bottom of the 90mm pipe, though this is easily cleaned if it becomes an issue. One design component I'd like to get into the system and have not worked out how yet is if I go away for an extended time (eg 6 weeks) and someone has to look after the system. I then want to take the RFF offline so that the task of emptying it is not required by whoever is looking after the system (would just prefer that all they have to do is feed and top up every now and then). Problem is if I just shut off the flow to the RFF the solids collect on the bottom of the tank and in the drain pipe and get way too funky. What I may do is run the output of the RFF into a vertical barrel GB and put a bypass round the RFF. This way I can dump the solids into the blue barrel GB for short amounts of time, then when I'm back I can put filtered water into the GB and give it time to mineralise the solids in it.. I also plan to cut some small holes into the top of the fish tank and put pots in the holes so that during the flood cycle the media in the pots is flooded. This would be a good solution for fiesty plants like mint and laksa. I did have one air stone running in the tank (other in the sump), though I think due to the deep shape of the tank and 26 degree water temp (very hot night), it was in no way enough. File comment: I'm going of mechanical timers - second one to fail in a year! Anyway, fish didn't seem in too bad a condition (other than being dead!) Their eyes were still pretty clear, so I scaled, gutted and gilled them and will give them a go. I was going to harvest most of them anyway, but pretty gutted to have them die from O2 starvation. File comment: 22 dead fish - about 10 survived. I ordered a 1200L/hour air pump and inverter last week so will setup a beefier backup system when that arrives (was only using the ac/dc resun 2 air stone system). How risky do you think it is eating fish in this circumstance? Some I had to finish off as they were barely alive - some had been dead much longer (long enough for rigamortis to set in). Bit devastated about it - not so much the loss of fish, but imposing a horribly way to die on them! The new air pump should at least give more confidence in the backup system. I'm trialing an electronic HPM timer now - only has 16 on /offs, though that s OK - I'll just run the system constant flood during the middle of the day. yeah - not great. Eat one last night and am fine today so at least they were not wasted (others vac sealed and in freezer). First Sp I've eaten - not wowed by the flavour - think they may be better in curries, smoked or flavoured asian style. Bit of an update - both systems are in and running now - greenhouse and shade house to be installed. The greenhouse system plants seem pretty happy, though with a few signs of defiency - feed going in is alot lower since the fish deaths, but there is 50 small SP fingerlings and 10 or so small (150mm) sp to power it. I added a good dash of seasol a few days a go as the spinach was showing signs of defiency, not sure what maybe manganese? File comment: tomato leaves curling - deficiency or heat stress? The shade house system is now up and running - it has a 1000L tank and a 500L tank inline with one of the GB outlets - that then SLOs back to the main tank. Its sending fish poo to the main tank to be pumped to the grow beds so will only use it for light stocking - Can also just separate it from the main system if I want a quarantine system. It also has a shallow GB - ok for leafy green and plan to get some microgreens going on it. It needs constant flow during the heat of the day else it gets to hot and stresses the plants. This is basically a reconfiguration of my first system. Looking good mate... I am wreslting with the whole greenhouse/ shade house thing and the need to cover my tanks to kill the algae but still be able to see the fish. My tank is covered in glav iron now and the algae is dying again but I cant see the fish. My tomato leaves are doing the same thing. Older leaves are curling up and becoming hard. not soft like other leaves..